In line with the WP 3 of the Marie Curie project QuantumLaP, T. J.-Y. Derrien is joining the group of Prof. Angel Rubio from March 1st 2018 to develop further the quantum theory of laser-matter interaction. He will be spending 70% of his time in the Theory Group of Max Planck Institute for Structure and Dynamics of Matter (Hamburg) and supporting the HiLASE (Prague) activities by 30% of the time. Dr T. J.-Y. 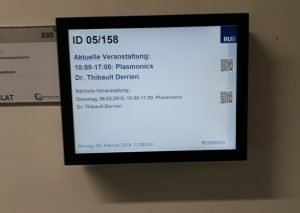 Derrrien has been invited by Bochum University (Germany) to provide 30 hours of lectures on the topic of Plasmonics, as a block-lecture course for the Erasmus Mundus Master program named “Laser Technologies and Photonics.” A written exam is planned in early March and about 10 people are expected. This research is funded by Marie Sklodowska-Curie Actions of the European Union (EU). ATLANTIC: CNRS-CELIA is leaving the Consortium presumably for safety reason.